Let’s stay with a similar theme. Imagine handing over your main Twitter account to different staff across a university. Now imagine giving it to the students too. This is exactly what’s been happening at George Mason University in Virginia, USA. 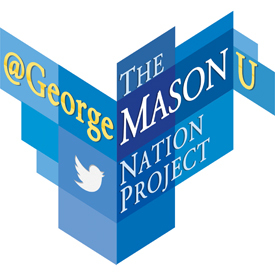 In the same way that @sweden claims to be the world’s most democratic Twitter account handing over control every week to someone new, the Mason Nation Project encourages everyone to get involved. You can read the full story here (thanks to EMGOnline). So far, over 40 new curators have been involved, including professors and students and 1200 new followers reached with a much more diverse and interesting array of content. We know many universities are desperate to engage more with their people – hats off to George Mason for seizing some initiative! So, more institutions are reaching out to their staff and students to live the social media dream with them. But how many have their leader showing the way? There is no doubt that at the University of Cincinnati, President Santa Ono not only leads the social media drive – he trail blazes the way. With almost 19,000 followers, and a staggeringly similar number of tweets to his name, @PrezOno has been described by Ad Age as ‘perhaps the best chief-exec Tweeter we’ve seen yet – relevant, sincere, often funny.” Many of his followers are students and President Ono has clearly grasped the opportunity to share his open strategy with the people that will most benefit from it. His mission to take the hashtag #hottestcollegeinamerica around the world with him is definitely a winner too! From people-engagement strategy to this from Georgetown in the USA. A video that captures a recent Graduation Day. A stop-start video that is done really well. And a layer of Tweets over the top to add an interesting angle to the story. Simple, clever and useful – just as great social media should be. We finish with a health warning. Don’t view this social media spark unless you’re prepared for a shock. For some, it’s more X-Rated than X-Factor. Two Australian comedians, Henry and Aaron treat us to a campus tour with a twist. It’s clever and certainly a little distasteful. As for funny? We’ll leave that to you to decide. The big news is that it’s generated almost 3 million views for the Central Institute of Technology in Australia. It reminds us a lot of the student-created, supposedly ‘banned’ videos a few years ago for the University of Lincoln in the UK. Not banned by You Tube though with one of the videos also managing 3 million views! To find out much more about The Future Index, the inspiration we are collecting and how it could be of use to you, please have a quick look at our summary page, complete with more samples for you to take away and use. Simply click here. Reblogged this on enigmedia marketing.